Every aspect of 1213 was designed with thoughtfulness and intention, and this piece of art in the 1213 lobby is no exception. Made out of intricate arrangements of nails, it’s not just any portrait, and she’s not just any woman. Her life has left a living legacy in Philadelphia. If you’ve ever walked into the lobby of 1213 Walnut, you’ve been graced by a large image of an elegant woman in pearl earrings. Maybe you walked past her without a glance, or maybe you stopped to wonder who she is and why she’s there. Every aspect of 1213 was designed with thoughtfulness and intention, and this piece of art is no exception. 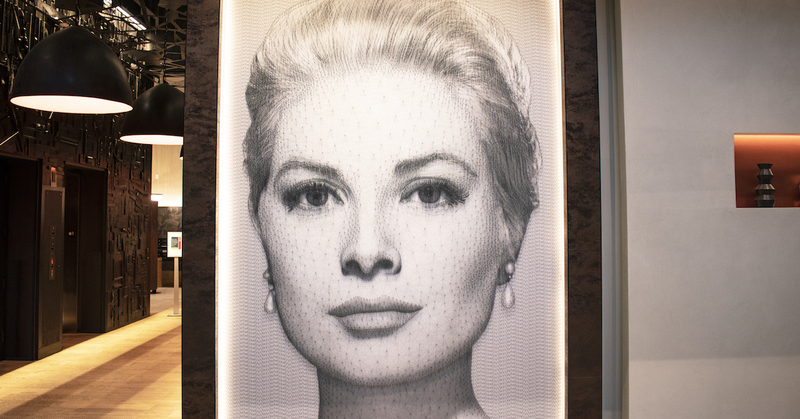 Made out of intricate arrangements of nails (so many that artist Matthew Olds stopped counting), it’s not just any portrait, and she’s not just any woman—she’s the actress and former Princess of Monaco Grace Kelly! “Grace Kelly is certainly the most famous Hollywood star to ever come out of Philly. She telegraphed a Philadelphia glamour that we aspire to and don’t always reach, but that we like to think of as ours,” said Michael Callahan, notable Philadelphia writer and author of the 2015 novel Searching for Grace Kelly. Grace Kelly was born at Hahnemann University Hospital in Philadelphia on November 12, 1929. Having an already successful family, she had big shoes to fill. Her father, John Kelly, was a three-time Olympic gold medalist and one of the best rowers to glide along the Schuylkill River. Her mother, Margaret Majer, attended at the University of Pennsylvania and was the university’s first woman to coach women’s athletics. The family lived in a two-and-a-half-story colonial home in East Falls, and Kelly attended the Ravenhill Academy down the road, which now belongs to Thomas Jefferson University. There, her dreams of becoming an actress flourished when she starred in multiple school plays. Upon graduation, Kelly applied to the American Academy of Dramatic Arts in New York, where she made her Broadway debut. She continued her career in television and eventually moved to film with her big-screen debut in Fourteen Hours (1951). Kelly gained popularity with her second film role in the Western High Noon (1952). She continued to star in a number of films, including Mogambo (1953), Hitchcock’s Rear Window (1954), Dial M for Murder (1954), and To Catch a Thief (1955), and most famously, The Country Girl (1954), which won her an Academy Award for Best Actress. Kelly’s fame didn’t stop at the big screen—she drifted from acting to live another fairytale life! She met Prince Rainier III, the Prince of Monaco, in 1955 and married him a year later, instating her as Princess of Monaco. She moved to a gorgeous castle on a cliff above the Mediterranean Sea, where she raised her family of three children. Although her childhood in Philadelphia was far away, Kelly often made trips home for ceremonial visits—including the city’s 300th anniversary—and honorary film festivals with attendees like Frank Sinatra and Jimmy Stewart. The royal family of Monaco still maintains Kelly’s roots in Philadelphia; her son, Prince Albert II, purchased the East Falls home in 2016. (If you’re itching to see the beautiful home in its original design, you can take a virtual 3D tour here.) He plans to occasionally live there with his family and also use it as offices for the Prince Albert II of Monaco Foundation. The house will also host events for the Princess Grace Foundation-USA, which provides scholarships to emerging talent in theater, dance, and film. Kelly’s multifaceted, dreamy life has left a living legacy in Philadelphia. Despite her high profile, Kelly never forgot where she came from. Kelly’s portrait in our lobby is a living testament to the dedicated hard work and the perpetual dreams that bloom in Philadelphia. We hope that as you walk into 1213 Walnut—whether as a resident or a visitor on a tour—you take a moment to admire the beautiful, talented woman who welcomes you home.